Members of Troop 45 with dancers during the Pow Wow. Paracord weaving, archery, atlatls, beading, leatheworking, flintknapping, BB guns, and Native American folklore… what do they have in common? They’re incredibly fun! 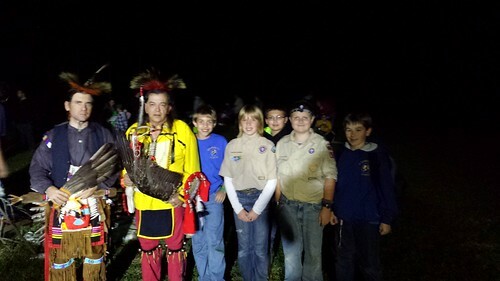 The troop attended the 2013 Pow Wow at Seven Mountains and had an absolute blast. Some of our older boys volunteered on OA staff to help make this event happen. We’re so thankful for their help because this event turned out to be great for youth, adults AND volunteers. Admittedly, we were hesitant to give up Peddle, Paddle and Pack, but in the end, we’re glad we checked this event out. 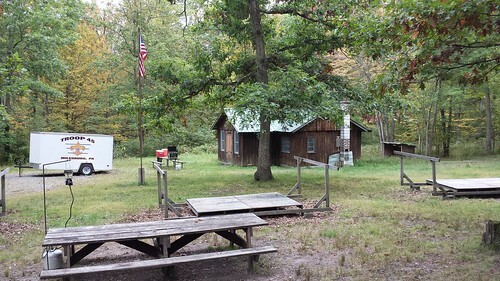 After pitching our tents at Wood campsite, we started off with a great cracker barrel on Friday night. We turned in around 11, then woke up on Saturday, bright and early. It was a day that was packed full of exciting stuff. The boys that participated couldn’t decide if the atlatls, leatherworking, paracord weaving or archery was best, but they all agreed that the event selection was great. By the time the sun went down, we found ourselves on the athletic field, dancing to the music from a Native American drum team, alongside authentic Native American dancers. We ended up wearing ourselves out because most of the boys just hung out in camp instead of going down to cracker barrel on Saturday. We finished our adventure off with a devotional led by a Native American speaker who talked about the importance of doing good, caring for others, and giving reverence to our creator. Overall, the event received two thumbs up. Thank you, Monaken Lodge for this great event.